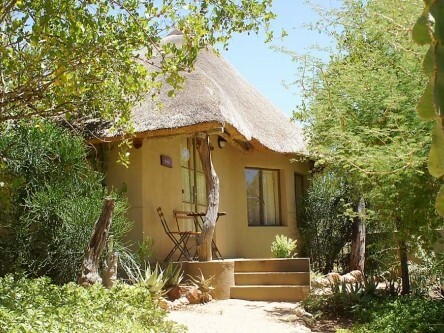 We have only three thatched, en suite, authentic African style rondavels, which means we can accommodate only six people, eight if two are children! While you are in camp, we try to disturb you as little as possible, leaving you plenty of time to really get to know the bush without us hovering around, without deliveries, phone calls and people working around you. However, we don’t ignore you – we will be around just enough to look after your needs. Leopard’s View Game Lodge is fully catered and we do not have any self-catering facilities. We provide three full meals per day as well as afternoon tea and homemade cakes. Breakfast always includes fruit, yogurts, cereals and full English breakfast to order. Lunch is generally a light, salad-based meal. In the evening, we provide a top-quality three-course dinner or a traditional South African braaivleis (BBQ). From Car Rentals, take the R21 signed to Boksburg – you need the right-hand lane immediately you come out of the covered Car Rental area. After a few kilometres, take the N12 signed to Witbank & Middelburg. The N12 joins the N4 at Witbank. Continue along the N4 until Belfast. At Belfast turn off the N4 on the R540: the road goes into the centre of the town and then is signed to the right to Dullstroom and Lydenberg. In Lydenberg, take the R36: the signs are not very clear, so care is needed. Go through Ohrigstad, and over the Abel Erasmus pass. Distance from OR Tambo International Airport – 465 km. Allow 51/2 to 6 hours, inclusive of stops.